These three sisters sell beauty products and essential oils. They already have a following on social media, but wanted an online hub and blog where they could connect with other moms and share their tips, tricks, and solutions for raising kids. They wanted their website to feel clean, simple, bright, and happy. Their goals with their website and blog are to support moms in different phases of their life--to help them feel beautiful inside and out and to navigate the waters of motherhood. I chose calm, muted colors in addition to white space in the website layout to achieve a clean, happy, modern aesthetic. I incorporated their brand concept of "riding the currents of motherhood" into the design elements and imagery. The website layout is user-friendly, intuitive and supports their website goals to connect with and support other moms. 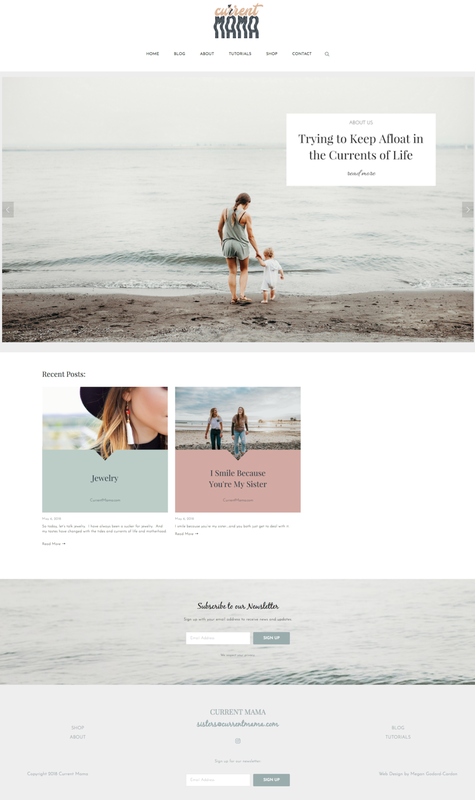 The Squarespace platform makes it easy to add new posts, and I created templates for them to create cohesive Pin-able images for their blog posts. I used custom CSS to elevate the design-making it feel less like a template, and more like a custom web design, but for half the cost/time of a full custom-coded website.